Karen Chace - Catch the Story Bug! : Wisdom, Wit and Wonder - Fabulous Fairy Tales! Wisdom, Wit and Wonder - Fabulous Fairy Tales! 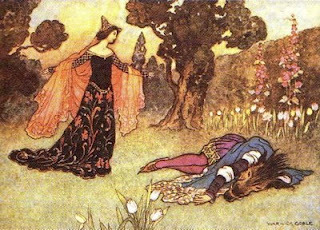 Recently, my colleagues and I have been discussing the lasting importance of fairytales amidst the plethora of personal stories on festival stages and at story slams. Don't misunderstand me, I love a well-told personal tale; I have taken part in story slams and strongly support my local organization, massmouth.org. The current popularity of that genre offers the wonderful benefit of introducing a younger audience to the art of oral tradition. However, more than ever it seems as if the old tales are being relegated back to the nursery and adults assume fairy tales are for children. 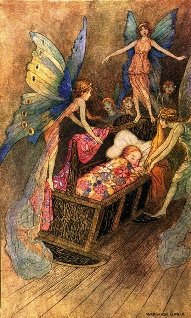 It is my hope that one day telling fairytales will be as mainstream and hip as The Moth and its facsimilies around the country. So here is short list of antique books on line, filled with stories. In the new year I will research and post more; the possibilites are endless. Fairytales contain the wisdom, wit and wonder of the ages. Give them a try and you just might be swept away by story! Andrew Lang’s Colored Fairy Tale Books – They’re all here from blue to violet! Czechoslovak Fairy Tales – Seventeen stories from the Baldwin Project. Fairy Tales by Howard Pyle, 1903. Fairy Tales from the Arabian Nights by E. Dixon, 1893. Fairy Tales from Many Lands by Katharine Pyle, 1911. The Evil One Who Married Three Sisters, The Seven Golden Pea Hens and other unique stories are found within. Fairy Tales and Folktales of the Irish Peasantry - Edited by W. B. Yeats and published in 1888 the stories are here to enjoy, courtesy of Sacred Texts. Revel in tales of the Merrow, Changelings, Pookas, Fairies and Banshees, Saints, Priests, Giants and Devils, Kings, Queens, Earls and Robbers; Yeats covers them all! Grimm’s Fairytales – 209 tales by the Brothers Grimm. Roumanian Fairy Tales and Legends by Mrs. E. B. Mawr, 1881. 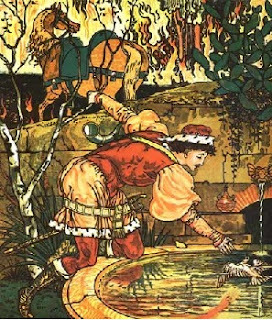 Russian Fairy Tales - The site shares twenty-one fairytales. Most offer both a short and long version, for those who want more details. Slovak National Fairy Tales - A Tribute to Pavol Dobšinský (Dobsinsky) -Interesting background information on the writer who created the largest collection of Slovak folktales. It also offers insight into the Slovak heritage and presents fourteen folktales. The Magic Ring and Other Oriental Fairy Tales by James Miller, 1861. The Wonder Clock – Literary Fairy Tales by Howard Pyle, 1887. There’s Magic in Fairy Tales – My blog celebrating the birthday of Harry Houdini from March of 2011. There are fairy tales filled with magic, crafts, curriculum and a fairy tale story stretch I wrote as well. Wonder Tales from Baltic Wizards by Frances Olcott, 1928. This blog post was researched and compiled by Karen Chace. Permission for private use is granted. Distribution, either electronically or on paper is prohibited without my expressed written permission. For permission please contact me at storybug@aol.com. Of course, if you wish to link to my blog via your website, blog, newsletter, Facebook page or Twitter please feel free to do so; I greatly appreciate your support and personal integrity. I have four of the Lang coloured fairy books, two of which ARE antiques! As is my copy of WB Yeats book - I swapped my perfect paperback copy at the library I used to work at for the old one which was falling apart so a copy would stay on the shelves! The old one was being discarded with no thought to replacement! I am a HUGE Kevin Crossley-Holland fan. My second real folk/faerie book was his Northern Lights book. My first was the Lang Blue Fairy Book! I still have both. As always: Thanks for sharing! Thanks for the additional resources Simon. I will list them in my next fairy tale blog post, with attribution to you of course! That is an impressive number of links to fairytales, Karen. Well done! I am heartened to see anything that encourages the discovery or rediscovery of fairytales. Fairytales were the victim of bad press at one stage here in Australia and no doubt in other countries. Some groups, apparently, believed they were not good for children because they feared children would take them literally - or some such adult nonsense. That attitude seems to be changing now so that parents and teachers are returning to fairytales. In some secondary schools these days students study fairytales and often create their own fractured fairytales. Although I love the traditional fairytales, I also think fractured fairytales a lot of fun. Red Riding Hood and the Three Little Pigs are typical subjects for fracturing. A very clever and successful example of Three Little Pigs retold and reworked is The Biography of Gilbert Alexander Pig by Gael Cresp. Gilbert, based on the legendary American trumpeter Gil Askey, uses negotiation and his trumpet to outwit and befriend the 'big bad wolf'. JB Rowley, educator, writer and storyteller. This is a fantastic compilation, Karen. Thanks so much Karen for your generosity!! Despite the fact some stories belong to more than one group, careful observer can learn a lot about differences between e.g. Slavs from East or South thus giving the opportunity to connect the development of fairy tale or folk tale with forming of nations and states. In my next fairy tale post I will remember to include it. Thank you for reminding me and for sharing your valuable thoughts. I went to your blog, which is full of wonderful information. Each newsletter I highlight a blog connected to storytelling. May I have your permission to highlight yours? Interesting information about Australia. I am so glad to hear the tides are changing. There has been a lot of research on why the dark side of fairytales are important to the psychological development of young children. I will try to find some of those articles and post them. I love fractured tales as well, they always make me laugh and I marvel at the writer's creativity. Thanks Juliet. So glad to know it may be useful to you one day. p.s. Your English is grand! Visit my Catch the Storybug Newsletter, a guide to wonderful websites to enhance your storytelling and teaching. Get it delivered right to your inbox!